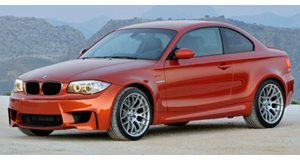 Schwaben Folia fixes up the 1 Series M Coupe with a unique look. BMW performance enthusiasts were stoked when the 1 Series M Coupe came along. After all, a nimble, turbocharged rear-drive coupe is just what the faithful were clamouring for. One German owner, however, found his metallic black coupe a tad boring, so he took it to Schwaben Folia for a fresh appearance. The result is the bright green beast you see here. The 1M Coupe was wrapped in bright and bold Irie Green vinyl, with matching trim to the wheel rims and even the engine-start button inside. The bright tint is offset by powder-black 19-inch wheels and a glossy black roof, with carbon-fiber grille, spoiler and mirror housings. The 335-horsepower turbo six was left essentially unchanged, but enhanced by a lightweight titanium exhaust and Bilstein shocks. Check out the photos courtesy of Yannik Holler Photography and Schwaben Folia.